დაცვის სტატუსი / Protection Status: SPA 6 ემთხვევა IBA-ს (GEO27). / SPA 6 is same as IBA (GEO27). დასაცავი სახეობები / Species of concern: ქოჩორა ვარხვი (Pelecanus crispus), მცირე ჩვამა (Microcarbo pygmaeus), წითელი იხვი (Tadorna ferruginea), წითელთავა ყვინთია (Aythya ferina), ბექობის არწივი (Aquila heliaca). აღნიშნულ ტერიტორიაზე, საქართველოში მცირე ჩვამას ერთ-ერთი ყველაზე დიდი პოპულაცია ბუდობს (100-150 წყვილი) (პაპოშვილი 2013). ამავე SPA-ში ბექობის არწივის 1-2 წვილიც ბუდობს. ჯანდარის ტბას მიგრაციისას და საზამთროდ 20000-მდე წყალმცურავი ფრინველი იყენებს. მათ შორისაა: 500-700 წითელთავა ყვინთია; 200-300 წითელი იხვი; 10000-15000 გარეული იხვი; 800-1500 ჭიკვარა, მცირე რაოდენობით თეთრთვალა ყვინთია, ქოჩორა ყვინთია, ამაყა და მცირე ბატასინა; 80-100 ქოჩორა ვარხვი; 200-500 დიდი ჩვამა (Paposhvili 2013). საქართველოს წითელ ნუსხაში ქოჩორა ვარხვი შეტანილია როგორც საფრთხეში მყოფი (EN), ხოლო ბექობის არწივი და წითელი იხვი – მოწყვლადი (VU) სახეობები. IUCN-ის წითელი ნუსხის მიხედვით ქოჩორა ვარხვის, წითელთავა ყვინთიასა და ბექობის არწივის კონსერვაციული სტატუსი მოწყვლადია (VU). / Dalmatian Pelican (Pelecanus crispus), Pygmy Cormorant (Microcarbo pygmaeus), Ruddy shelduck (Tadorna ferruginea), Pochard (Aythya ferina), Eastern Imperial Eagle (Aquila heliaca). There is one of the biggest breeding populations of Pygmy Cormorant in Georgia (100-150 pairs) (Paposhvili N. 2013). 1-2 pairs of Eastern Imperial Eagle are breeding in SPA. 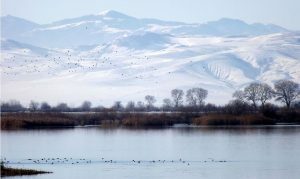 Lake Jandari is used by over 20 000 water birds for wintering. Large numbers of waterbirds use site during spring and autumn migration. (Paposhvili 2013). 500-700 Pochards; 200-300 Ruddy Shelducks; 10000-15000 Mallards; 800-1500 Teals and a small number of Ferruginous Pochards, Tufted Ducks, Goldeneyes and Smews; 80-100 Dalmatian Pelicans; 200-500 Cormorant have been recorded wintering on Lake Jandari (Paposhvili N. 2013). Some species are included on the red list of Georgia, Dalmatian Pelican as Endangered (EN); Eastern Imperial Eagle and Ruddy Shelduck – Vulnerable (VU). Dalmatian Pelican, Pochard and Eastern Imperial Eagle are also included on the IUCN red list as Vulnerable (VU). ტერიტორიის აღწერა / Description of the site: SPA ჯანდარი საქართველოს სამხრეთ-აღმოსავლეთ ნაწილში, ზღვის დონიდან 300-400 მეტრ სიმაღლეზე მდებარეობს. ჯანდარის ტბა საქართველო-აზერბაიჯანის საზღვარზეა და SPA-ს მნიშვნელოვან ნაწილს წარმოადგენს. ტბის ნაპირის დიდი ნაწილი ლელითაა (Phragmites australis) დაფარული. ალაგ-ალაგ ვხვდებით ჭალის ტყის ფრაგმენტებს, სადაც ძირითადად ვერხვი (Populus canescens), ტირიფი (Salix alba) და იალღუნია (tamarix ramosissima) წარმოდგენილი. ტბის შემოგარენში ნახევარ-უდაბნოსა და სტეპისთვის დამახასიათებელი სახეობები – ძეძვი (Paliurus spina-christi), მწარე აბზინდა (Artemisia lerchiana) და Botriochlora ischaemum-ია გაბატონებული. ორნითოფაუნა იხილეთ http://aves.biodiversity-georgia.net / Jandari SPA is located in the Southeastern part of Georgia, at an altitude of 300 – 400 meters. 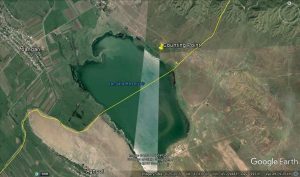 Georgian-Azerbaijan border splits Lake Jandari in half. Reeds (Phragmites australis) and fragments of riparian forest with Poplar (Populus canescens), White Willow (Salix alba), and Salt Cedar (tamarix ramosissima) grow on the shore of the lake. Hills with semi-arid and steppe vegetation are surrounding Lake Jandari. Garland thorn (Paliurus spina-christi), Wormwood (Artemisia lerchiana) and Perennial grass (Botriochlora ischaemum) are dominant plant species (Kvachakidze 2010). See http://aves.biodiversity-georgia.net for Avifauna. საჭირო აღჭურვილობა / Needed Equipment: ტელესკოპი 20X60 გადიდებით შტატივთან ერთად; ბინოკლი 8X ან 10X გადიდებით; GPS / 20X60 magnification spotting scope; 8X or 10X magnification binoculars; GPS . მეთოდის აღწერა / Description: მობუდარი წყვილების დასათვლელად და ბუდობის წარმატების შესაფასებლად მინიმუმ ორი საველე ექსპედიციაა საჭირო. მაისში, პირველი ექსპედიციის დროს, ბუდეებს აღმოაჩენთ და თითოეულ ბუდეში ბარტყების რაოდენობას დაითვლით. ბექობის არწივის ბუდეები მაღალ ხეებზე ან ელექტროგადამცემ ბოძებზე უნდა ეძებოთ. ბუდის აღმოჩენისას აღრიცხვის თარიღს, ბუდეების GPS კოორდინატებსა და ბარტყების რაოდენობას ჩაინიშნავთ. შემდეგ საველე გასვლას ივლისში, ბუდობის წარმატების შესაფასებლად განახორციელებთ. ბარტყებს ხელმეორედ დაითვლით და იმავე ბუდეზე პირველი ექსპედიციის დროს აღრიცხული ბარტყების რაოდენობას შეადარებთ. / At least two field expeditions are required to count nesting pairs and to assess breeding success. During the first expedition nests are discovered and nestlings are counted. You should try to find Eastern Imperial Eagle nest on high trees or electricity pylons. Date, GPS location of the nest and number of nestlings are recorded. During the second expedition the breeding success is assessed – number of chicks are counted on the same nests were checked during the first expedition. Expedition dates and nesting habitat description see in table 1. July მაღალი ხეები და ელექტრო გადამცემი ბოძები / In high tree usually poplar or juniper or on electricity pylons. საჭირო აღჭურვილობა / Needed Equipment: ტელესკოპი 20X60 გადიდებით შტატივთან ერთად; ბინოკლი 8X ან 10X გადიდებით; GPS / 20X60 magnification spotting scope; 8X or 10X magnification binoculars; GPS; Inflatable boat. მეთოდის აღწერა / Description: მცირე ჩვამები ჯგუფებად ან ცალკეულ წყვილებად ცხოვრობენ. ისინი საბუდრად ხშირი მცენარეულობით დაფარულ, ტბის ან მდინარის ნაპირებს ირჩევენ. ბუდეს კარგად შენიღბულ ადგილას, ხეებში ან ხშირ ბუჩქნარში, ტოტებისა და ლელისაგან იშენებენ. აღრიცხვებს ყოველ წელს ივნისის პირველ კვირაში, ინკუბაციის დროს ატარებთ. ცალკეულ ბუდეებსა და კოლონიებს აღმოაჩენთ. შემდეგ ბუდეების საერთო რაოდენობასა და მათ შორის, დაკავებული ბუდეების რაოდენობას დაითვლით, რაც მობუდარი წყვილების რაოდენობის ტოლი იქნება. თითოეულ კოლონიას ან ცალკე მყოფ ბუდეებს უნიკალურ სახელს მიანიჭებთ და შემდეგ ინფორმაციას ჩაინიშნავთ: თარიღი, ცალკე მყოფი ბუდეებისა და კოლონიების GPS კოორდინატები, არსებული და დაკავებული ბუდეების რაოდენობა ჩანიშნული საბუდარი ადგილების მიხედვით. / Pygmy cormorants live in pairs or in colonies. For breeding they choose lake and river banks with dense vegetation. Field expedition should take place at the beginning of June during incubation. Colonies and separated nest should be discovered and unique names should be given to each nesting place. Date, number of total and among them occupied nests and GPS locations for each nesting place should be recorded. მეთოდის აღწერა / Description: წყალმცურავი ფრინველებს ჯანდარის ტბაზე, დეკემბრიდან მაისამდე, 2 კვირაში ერთხელ ითვლით. ყოველ ჯერზე, სახეობრივი მრავალფეროვნებისა და მათი რიცხოვნობის მონაცემებთან ერთად კლიმატური პირობებსაც ინიშნავთ. მონაცემებს მონაცემთა ბაზაში ტვირთავთ. სათვლელი წერტილი იხილეთ რუკა 1. / Water Birds should be directly counted with 2 weeks interval from December to May on Jandari Lake. Date, weather conditions, Species and number of birds should be recorded. Count data should be recorded in the database. Counting point position and coordinates see on the Map 1. Crex crex Corn crake ღალღა BB NT ? Porphyrio porphyrio Purple Swamphen ხონთქრის ქათამი FB LC ? Gallinago media Great Snipe დიდი ჩიბუხა (გოჭა) M,WV NT ?